The twenty year five month career of D7609/25259 included allocations to Eastern Region & London Midland Region depots. Dual brake equipped (January 1975). Time between withdrawal and scrapping: 106 months. 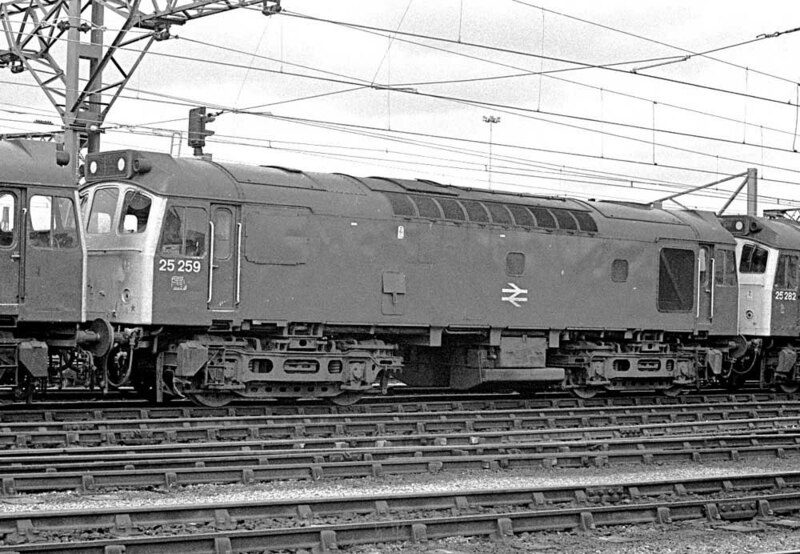 25259 was the 291st Class 25 withdrawn, one of three retired during August 1986. After withdrawal 25259 was stored at Bescot Yard until moved by road on June 15th 1995 to M C Metal Processing, Glasgow. The locomotive arrived on June 16th 1995 and had been scrapped by June 27th 1995. Prior to scrapping the engine-generator set and the bogies were salvaged for re-use in preserved D7633 on the Severn Valley Railway. 25259 had been one of the last Class 25s to receive a C exam at Bescot, after which it did not turn a wheel prior to its withdrawal. Noted Derby Works December 1974 - January 1975 (dual brake equipment fitted). Noted Derby Works January - April 1980 (general repair). Being allocated to Tinsley from new D7609/25259's first recored passenger working took place on July 9th 1966 working the roundtrip Sheffield - Llandudno Town. On July 1st 1967 D7609 was noted at Grassmoor Junction in each direction, presumably working an East Midlands - Yarmouth roundtrip. On August 19th 1967 D7609 again worked the roundtrip Sheffield - Llandudno Town. When 7609 was released from Crewe Works during 1970 it is reported as being outshopped with cabside arrows and body side numbers. From May 1973 to November 1982 7609/25259 was allocated to Bescot, allowing many opportunities for passenger work. On July 20th 25259 & 25254 worked a roundtrip Leicester - Skegness, whilst on August 17th 25259 was noted at Birmingham New Street on an unidentified passenger working whilst the next day (Aug 18th) 25259 & 25159 worked a roundtrip Derby - Skegness. 1975 produced more seaside workings. On March 31st the 09.20 Birmingham New Street - Poole was worked to Reading by 25259 & 25095. On June 21st the 14.15 Yarmouth - Derby from Norwich was hauled by 25259 & 25165(? ), having replaced 25081 & 25280 off the outward leg. The next day (22nd) 25259 & 25165 worked a roundtrip Derby - Skegness. When 47532 caught fire near Llanduno Junction on August 12th whilst working the 02.18 Crewe - Holyhead 25259 dragged the train to Llandudno Junction where 24036 took over for the run to Holyhead. A Derby - Skegness roundtrip was worked on September 4th by 25259 & 25316. A surprise visitor to Ranelagh Bridge during the morning of May 31st was 25259. 1978 produced a number of passenger workings during the months of June, July & August. June 24th/25th saw 25259 on Cambrian line duties. On June 24th the 04.15 Shrewsbury - Aberystwyth and 10.07 Aberystwyth - Euston to Wolverhampton were worked by 25259 & 25301. The next day (25th) the same pair worked the 08.45 Birmingham New Street - Barmouth and 17.45 Barmouth - Euston to Wolverhampton. A month later on July 22nd 25259 & 25262 worked the 10.40 Euston - Aberystwyth from Wolverhampton, returning with the 16.10 Aberystwyth - Shrewsbury. The next day (23rd) 25259 & 25245 worked a roundtrip day excursion Birmingham New Street - Barmouth (?). On August 5th 25259 & 25262 worked the Walsall - Norwich (for Yarmouth) - Derby diagram. The next day (6th) the same pair worked a Derby - Skegness roundtrip. Towards the end of the month on August 26th the 04.15 Shrewsbury - Aberystwyth and 10.07 Aberystwyth - Euston to Wolverhampton were worked by 25259 & 25145. The passenger workings for 1979 definately had a Cambrian line flavour. On June 2nd the 10.10 Euston - Aberystwyth from Birmingham New Street and the 16.10 Aberystwyth - Shrewsbury were worked by 25259 & 25032. The next day (3rd) the same pair were noted on a passenger working at Madeley Junction, possibly an additional Barmouth turn. On July 7th 25259 & 25327 worked the same turns as June 2nd. The same pair were seen the next day (8th) at Birmingham New Street on a passenger working. Two weeks later 25259 & 25277 worked the July 27th's 10.10 Euston - Aberystwyth from Birmingham New Street and the return 16.10 Aberystwyth - Shrewsbury. The 04.15 Shrewsbury - Aberystwyth and 10.09 Aberystwyth - Euston to Wolverhampton were worked by 25259 & 25325 on September 8th. More Cambrian turns followed for 1980, beginning on June 1st with the 08.45 Birmingham New Street - Aberystwyth and the 18.10 Aberystwyth - Euston to Wolverhampton hauled by 25259 & 25282, with 25259 working only to Machynlleth, being replaced by 25325. The 04.10 Shrewsbury - Aberystwyth and 10.07 Aberystwyth - Euston to Wolverhampton were worked on June 14th by 25259 & 25184 and on August 16th by 25259 & 25277. The next day (Aug 17th) the same pair worked the 08.45 Birmingham New Street - Aberystwyth and the return 18.00 Aberystwyth - Euston to Wolverhampton. Photograph courtesy Dave Smith 25259 on the Up Goods line at Rugby yard with Driver Jack Owen looking out through the cab window. The date is August 27th 1980. 1981 has so far produced only one recorded passenger working, on February 15th the 19.00 Paddington - Birmingham New Street failed at Banbury behind 47491, 25259 took the service forward to Birmingham New Street. 25259 was stabled at Cockshute on April 11th. 25259 was noted southbound (?) at Winwick with three ferry wagons on June 29th. On August 2nd & 3rd 1982 25259 worked the 10.15 Chester - Llandudno Town. A month later on September 4th 1982 25259 & 25285 worked the 07.40 Euston - Aberystwyth from Wolverhampton and the 14.00 Aberystwyth - Shrewsbury. On September 3rd 25259 was noted northbound at Washwood Heath with a trainload of scrap. 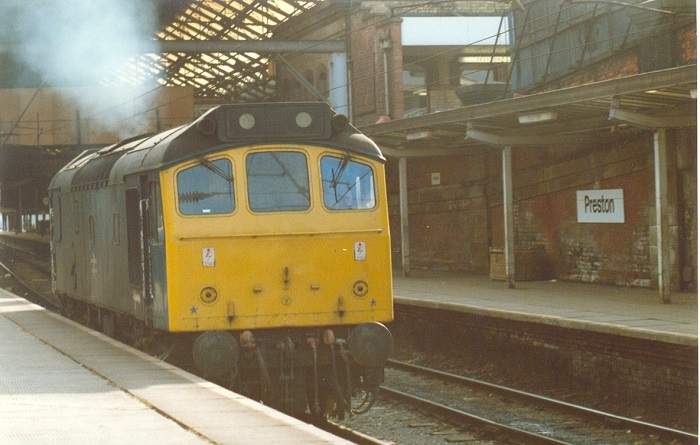 From November 1982 25259 was transferred to Crewe. On November 25th the Prince & Princess of Wales traveled from Euston to Central Wales by Royal Train. From Shrewsbury to Aberdovey/Towyn 25259 & 25278 were in charge, with 25044 on standby. Due to restrictions on Barmouth Bridge the train went no further north than Morfa Mawddach. An overnight stop was made at Rossett prior to the Royal party visiting Wrexham & Hawarden on 26th. Photograph courtesy Geoffrey Bannister. 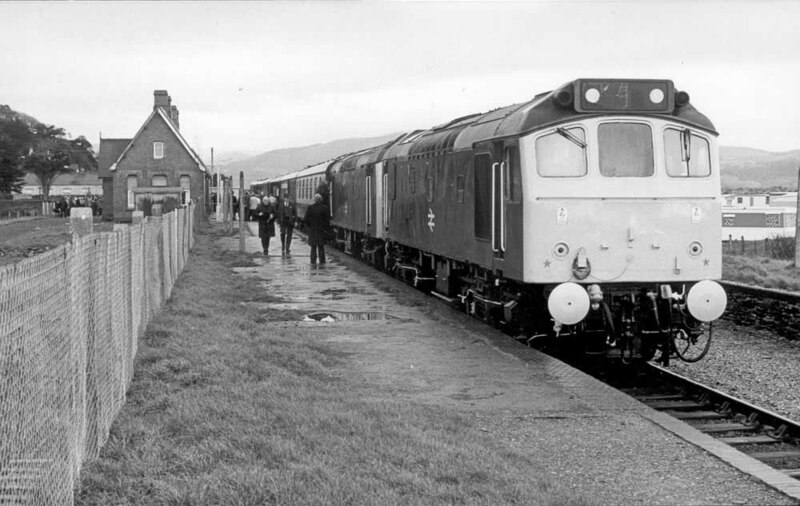 25259 & 25278 stand at Aberdovey on a damp November 25th 1982 having conveyed the Prince & Princess of Wales for a visit to the area. Clearly visible on the cabfront & lamp iron is the cable carried by the locomotive to support the radio telephone communication equipment. This is believed to be the last time that Class 25s were called upon to work the Royal Train. On January 29th 25259 was receiving attention at Springs Branch depot. 25259 & 31280 were noted at Severn Tunnel Junction on February 20th. 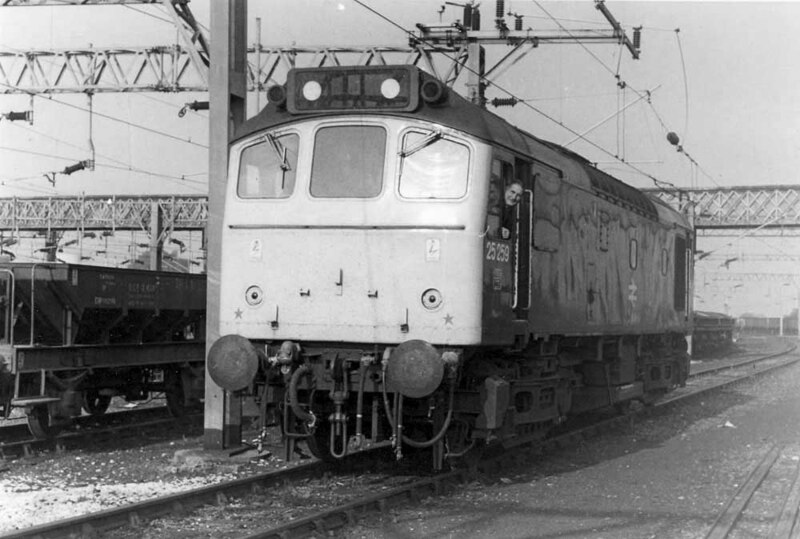 On an unknown date during 1983 25259 became derailed at Bedford with one bogie buried in the ballast. 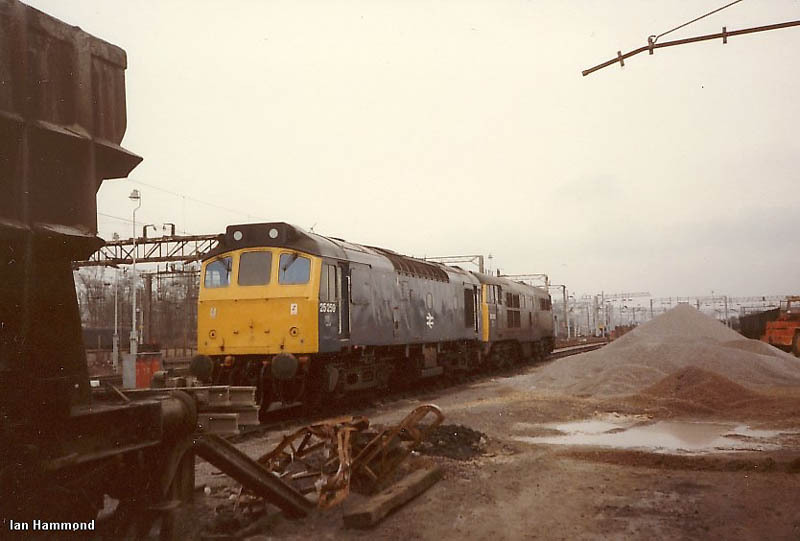 Photograph courtesy Tony Sayer 25259 in a line of locomotives at Guide Bridge on March 26th 1983. 25259 ended up dumped at Bescot, it would remain here for almost nine years before moving to MC Metals, Glasgow for scrapping. It would provide many parts for preserved 25283 prior to scrapping during June 1995. 25259 was stabled at Guide Bridge on April 1st. 25259 was noted westbound at Great Rocks with a loaded ICI limestone train on April 14th. Recorded passenger workings for 1983 were few. On June 18th 25259 & 25315 worked the 10.10 Euston - Shrewsbury forward from Birmingham New Street. Two months later on August 20th the 07.35 Euston - Aberystwyth from Wolverhampton and the 14.00 Aberystwyth - Shrewsbury were worked by 25259 & 25276. 25259 was noted light engine through Leighton Buzzard on September 25th. 25278 & 25259 worked the Broughton Lane - Ditton BOC empties on October 8th, whilst the same working was handled by 40118 & 25259 on October 11th. 25259 was stabled at Severn Tunnel Junction on October 30th. The lunchtime Tyne - Healey Mills freight was worked by 25259 on December 22nd. With 25259 still allocated to Crewe during 1984 a little variety was added to the Cambrian line services. On March 18th (or 23rd?) the 10.15 York - Liverpool failed at Manchester Victoria behind 47427, 25259 worked via Bolton & Wigan (engineering work diversions) to Liverpool. A pair of Class 25s with 25259 leading were noted southbound at Leyland on April 17th with a train of track panels. 25285 & 25259 were stabled at Severn Tunnel Junction on June 23rd. A week later on June 30th the 10.10 Euston - Shrewsbury from Wolverhampton was worked by 25259 & 25249. 25259 & 25258 were noted passing Stoke on Trent with a loaded sand train from Oakamoor on July 6th. 25282 & 25259 worked the 6V32 14.55 Ellesmere Port - Severn Tunnel Junction freight on July 17th. 25259 was noted at Derby on a four vehicle parcels train on July 25th. On August 4th 25259 & 25287 worked the 07.35 Euston - Aberystwyth from Wolverhampton and the return 14.00 Aberystwyth - Shrewsbury. August 24th found 25259 & 25279 working an early morning Ditton � Margam special throughout. Two days later on August 26th 25259 & 25279 worked the 03.33 Crewe - Preston (via Chester), the relief 13.13 Preston - Barrow and the 18.21 Barrow - Liverpool. 25259's last passenger visit to the Cambrian line took place on September 15th with 25297 working the 07.44 Shrewsbury - Aberystwyth and the return 10.10 Aberystwyth - Euston to Wolverhampton, this was the last day for scheduled Class 25 passenger haulage on the Cambrian line. 25259 & 25284 worked a train load of sand from Oakamoor to St Helens on September 19th. 25259 was stabled at Buxton on September 22nd. On the damp evening of November 12th 25259 was noted at Manchester Victoria with a short parcels working for the Oldham Loop. Engineering work on November 18th saw 25259 assist the 17.40 Manchester Piccadilly - Birmingham New Street with 86242 between Manchester Piccadilly & Macclesfield. On January 3rd 25259 hauled the afternoon Newcastle � Bristol postal working. The 19.30 Inverness - Euston on January 20th required the assistance of 25259 between Preston & Crewe due to power being off for engineering work. On April 2nd 25259 & 25254 were noted at Crewe station light engines. On April 6th 25259 & 25302 were noted southbound at Ais Gill with a diverted sixteen vehicle parcels train. On April 8th the 19.39 Crewe - Cardiff was worked by 25259. 25259 & 31280 worked the 1B83 17.35 Cardiff - Gloucester parcels comprised of three bogie vehicles on April 16th. On May 4th a diverted early morning Willesden � Coatbridge freightliner was noted through Newcastle behind 25249 & 25259. Two days later (6th) the same pair passed through Huddersfield on oil tankers. 25259 was noted on parcels stock at Preston on the evening of June 24th. A relief 07.59 Nottingham - St. Pancras service on July 5th was worked by 25259, the relief being added due to congestion caused by engineering work on the M1 motorway. 25259 was noted southbound at Springs Branch with bitumen tanks (from Skipton?) for Ellesmere Port on August 28th. 25259 was stabled at Birkenhead on August 29th. On September 6th the 17.40 Euston - Chester surrendered 47523 for 25259 at Shrewsbury for the run to Chester, the Class 47 being required for other purposes. 25259 was stabled at Nuneaton station on September 14th & 15th. The first week of December saw the afternoon Manchester � Bristol parcels almost totally in the hands of the Class 25s, this included 25259 on 5th. Other workings over the Marches line included 25259 (3rd) on the Albion � Waterston oil empties, at least as far as Hereford so that it could replace the failed Hereford pilot. Photograph courtesy Ian Hammond An unknown date in 1985 finds Bletchley sidings home to a large pile of ballast, 25259 and a piece of junk. 25259 was one of those machines to get stored at Bescot, with its last journey being on the M6 northwards to MC Metals in 1995. 25259 was noted at Marylebone on January 11th. On April 19th 25259 was noted at Shotton with a train of empty mineral wagons to be delivered to a location along the North Wales coast for weekend engineering work. The final passenger working for 25259 took place on April 28th 1986 working the 14.17 Bangor - Cardiff forward from Crewe after 33051 failed. On May 6th 25259 worked what is believed to be a Carnforth - Barrow trip working. 25259 was the Manchester Victoria pilot on May 7th. 25259 was noted passing Flag Lane, Crewe with a parcels train on May 9th. 25259 was noted at Crewe station on May 10th. 25259 was stabled at Crewe on May 31st. 25259 & 25911 were noted eastbound at Manchester Victoria with a track panel train on June 7th. On June 16th 25259 was noted eastbound at Flint with a Speedlink freight. 47337, 25259, 25903 & 25901 were noted westbound at Slutchers Lane, Warrington on July 19th. 25259 was withdrawn on August 21st 1986. No.2 cab: driver's side blanking plate, scrape/dent in middle of panel extending half the length of the panel: July 1984 until withdrawn. No.2 cab: 2nd man's side blanking plate, scrape/dent in middle of panel extending whole length: September 1982 until withdrawn. A builders plate from 25259 (Derby 1965) sold at Great Central Railwayana Auctions for �290 during March 2018. Page added September 14th 2013. Last updated August 25th 2018.